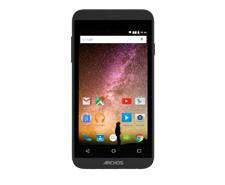 ARCHOS FAQ - How to reinitialize my ARCHOS 40 Power ? Turn off the device with the ON/OFF button or you can remove and replace the battery. Hold the ON/OFF button then press the Volume + button until the device starts. As soon as the ARCHOS bootlogo is displayed, release the ON/OFF button and keep holding Volume +. Hold down the ON/OFF button again and press the Volume + button once to display the Android system recovery menu when the green robot is displayed.